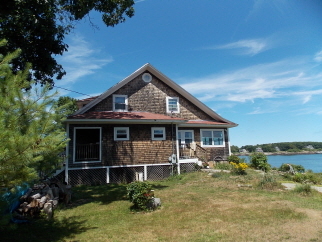 Turn-of-the-century 3 bedroom, 1 1/2 bath home sitting directly on the edge of the ocean. Carefully maintained and cleaned, this 1920's home has history, charm, character and direct oceanfront views and access. Situated on a large waterfront lot with parking for 4 cars, enter a time when relaxation and comfort were the standard, from the amazing views from the entire rear of the property to the large claw-foot tub in the generously-sized full bath with separate shower to the large yard with plenty of space to sit and enjoy the ocean. On the first floor you'll find a well-stocked kitchen, dining room, large living room with wonderful views of the ocean and lighthouse, tv with cable and wifi, a half bath and an enclosed porch stretching across the rear of the home and affording views of the back yard and ocean. Upstairs there are 3 bedrooms (1 king bed, 2 queens) and a full bath with large soaking tub. Washer/dryer, bbq and picnic table, large stone fireplace.